Jujube fruit is also referred to as Chinese dates, Korean dates, red dates, or Indian dates. Jujubes (Ziziphus jujuba) grow on a small deciduous (loses its leaves in the winter) trees. Jujube trees grow to around 30-40 feet tall, and with small shiny green leaves, tiny blossoms, with grape-to-kumquat sized fruits that contain a single large seed in the center. Jujubes are light green to red inside and out, with a crispy texture, a thin edible skin, and a sweet-tart, apple–strawberry-banana flavor. They can be stored when they are ripe, at room temperature for about a week and longer in the refrigerator. The most common and best tasting Jujube fruit varieties are Sherwood, Sugar Cane, Li, Chico, and Honey Jar The best drying varieties are Lang and Shanxi Li. It’s important to always have two varieties for good pollination for high fruit set. They were introduced into the United States in the late 1800s for drying much like dates, but they were not a hit. It wasn’t until the 1900s that great tasting Jujube varieties were imported into the U.S.
Its native range is East Asia, China, and Japan. The fruits can be left to become wrinkled and spongy, which increases the Jujube’s sweetness and can be eaten fresh or cooked. Dried jujube fruit can be used to substitute dates or apples in recipes. Peel the fruit (or not) and remove the single seed inside. Jujubes can be pickled whole or used to make tea. Consuming just under a one-half cup of fresh jujube fruit fulfills over 100 percent of your daily vitamin C requirement. This is an easy way to fight free radical damage and stave off disease. Jujube fruit contains 20 times more vitamin C than any citrus fruit. Vitamine C strengthens the immune system and fighting infections, which may be why they’ve been used medicinally for 1,000’s of years in many cultures, for example as a tea for a sore throat. A cup of jujubes has around 12 plus percent of your daily potassium needs. Potassium is excellent for keeping your blood pressure at healthy levels, which in turn is beneficial for heart health. Jujube fruit’s potassium is helpful for keeping the blood vessels relaxed. When blood vessels are relaxed, blood flow and pressure is much better. It was found that water extracted from jujubes has demonstrated its potential at hindering cancerous cells. A study of the Vaccine and Serum Research Institute examined the water extracted from jujube fruit (dried) for possible anticancer effects of automatic cell death of human tumor cell lines. Using DNA fragmentation analysis, researchers showed that jujube fruit extract suppressed the human tumor cell lines, particularly leukemia line. This scientific study showed jujube’s remarkable ability to kill off tumor cells, making jujube fruit a potential cancer-fighting food. Traditionally Jujube fruit has been used as a tea, soup, puree, or paste to improve digestion. 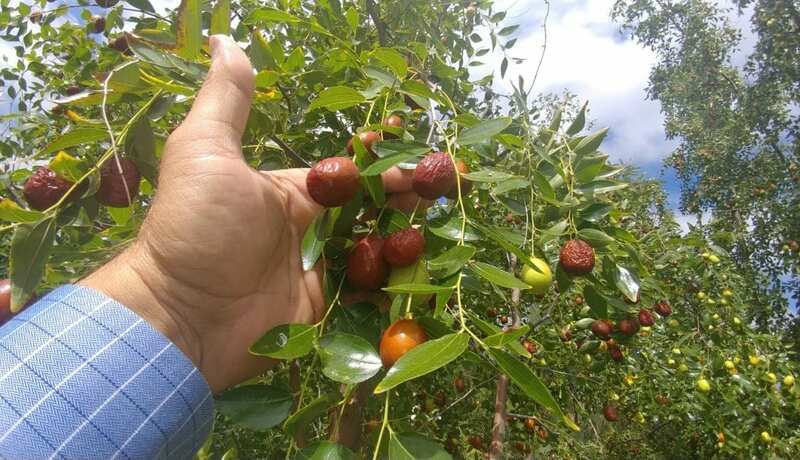 One study published in the Journal of Agricultural and Food Chemistry explained that an adequate consumption of jujube fruit each day will reduce the exposure of intestinal mucosa to toxic ammonia and other harmful compounds and improve the overall gastrointestinal environment. A particular digestive benefit of jujube fruit is relief from the common problem of chronic constipation, acting as a natural constipation treatment. One study published in Digestion studied the safety and effectiveness of an extract of jujube on people with constipation. One group received liquid Jujube fruit and the other group placebo. They did this for 12 weeks. The jujube group, symptoms normalized in 84 percent of subjects, but only 12 percent of the placebo group showed improvements. The study concluded that jujube extract is a useful and safe treatment for chronic constipation. When you increase minerals like calcium, phosphorous, and iron (all of which are in jujube fruit), you’re ensured that your bones will remain resilient and strong. As we age, we tend to suffer from osteoporosis and other bone degrading conditions so jujube fruit, added to your diet, can reverse or slow this trend. The alkaloids and saponins found in jujube fruit have been directly linked with eradicating harmful toxins from the body’s systems and purifying the blood. This antioxidant effect can help prevent a significant number of diseases, and also ease the stress on the immune and lymphatic system.